Recently I was assisting a client with a recruitment project by doing their screening interviews for them. Those short 15-20 minute phone calls that are informal but oh so telling – when conducted the right way. There were a few key lessons about reputation from that experience that I’d like to share with you here. One candidate that I contacted was about to start an annual holiday with family, yet was very clear that the role was of interest and that the candidate would be available for both the screening interview and the follow up interview by skype if required. Result: impressive level of commitment to this role. Being careful not to read too much into it, this candidate could be demonstrating the types of behaviour traits any employer would want. Or the person could be desperate for a job. Another candidate that I contacted called me back rather than emailing or sending an SMS as I’d requested to arrange a time to speak. This was awkward for me as I was in the car and had no access to my diary (blue tooth is fine for calls but not checking my diary) and also as the number was not listed in my contacts list. How I answered must have sounded slightly tentative. We had a brief chat and once I was out of the car I confirmed the time by SMS. Our screening call went well and when I briefed the client I was told that this candidate has been ringing the office very frequently checking if there are any jobs available and on the progress of this application. Result: Initial impression of super keen and great attitude, with the longer term impression of someone who might burn relationship bridges with co-workers by constant calling even before the opportunity to work as part of the team. Another candidate responded to my initial request to “contact me with a time between 8.30 and 12.30 for us to have a brief chat about your application for XYZ role” with “What job is this for?” Result: impression that “my job” the one I am wanting to interview for is not important to the candidate. For someone to show a low level of interest at the interview stage, after they have submitted an application, doesn’t auger well for their level of interest and behaviour as an employee. Things that make you go hmmmmm. This response indicated that the person a) hadn’t read my message correctly and b) that there had been a scatter gun approach to job applications. Well I was applying for a job rather than working for myself a while ago and I was sending 2 or 3 applications out each day, and some companies were taking up to 4 weeks to get back to me. That’s up to 60 applications later and I could never keep track. How would I know which application might have been followed up? Most companies don’t even do the courtesy of responding! Yes some companies do not respond to all applicants – there are many reasons for this (and I’ve posted in LinkedIn professional forums with my views that some form of response is always important). Why does that then provide an excuse for an applicant to do anything other than be ready for a response? Sure it’s disappointing and frustrating and soul destroying when application after application is not responded to. When someone claims on their application or responds to a job seeking good organisation skills this response is a big NOT SUITABLE. When applying for a variety of roles, keep a spreadsheet of key details so you can keep track and also respond appropriately when you are contacted. Be clear 0n what you want to be known for and take steps to make sure you behave that way. Remember that your reputation is supported or created by others in your network. We speak of the world being a small place and that there are 6 degrees of separation. Be consistent with how you behave in regards to your reputation. If you claim to be well spoken, then every interaction that anyone has with you needs to support and enhance that impression. Behave now in a way that you can sustain. We speak of a honeymoon period in a new role when forgiveness for mistakes is easier to get than once you are established, and it is also the period for which people can “hold on to” a facade. To build a strong and resilient reputation, start the way that you intend to always work. That includes energy, enthusiasm and work hours. (exceptions and all hands on deck situations aside) be aware that how you start is the way that others get to know you and then expect you to behave. Reputation is important to all of us online and offline, or “live” as I have seen it referred to recently. Whether you are seeking a promotion, a new business partner or to boost your connections. I trust that this post has been helpful. Feel free to contact me if you would like to clarify anything you’ve read here or to find out ore about what I do to help people and teams to improve and enhance their reputations. 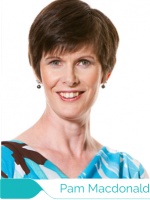 People Performance and HR Strategy expert Pam Macdonald walks the walk and talks the talk. With a career spanning 20+ years Pam has seen it all in HR and now works with leaders on improving themselves and how they lead their teams.Pam has a unique combination of executive HR, change management and practical line management expertise that places her as a highly sought after expert, advisor and facilitator. Pam Macdonald © 2019. All Rights Reserved.